Carpenter ant on a wall. It's cold out right now in Sacramento so we don't typically see many ants roaming around outdoors much. Indoors where it's warmer, can be a different story however. About a year ago, I started seeing a few random large ants wandering around my house. Because it wasn't a trail of ants that I could see going to any particular food source, I wasn't too concerned. 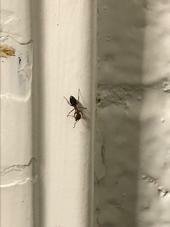 Random ant? No big deal. Then they were gone with the cold weather. As the weather warmed up, I noticed in one bedroom closet, some droppings that looked like a mixture of chewed stucco, various insect body parts, and some black bits of something. I wasn't seeing ants at this time, just this debris. What was causing it? Could it be carpenter ants? Bed bugs can occur in any hotel whether it's a 5-star or 1-star hotel. I tend to stay in hotels rated somewhere in between these, but I always check for bed bugs before even putting my things away or sitting down.